Looking forward to investing in cabinets with an appealing design and additional features geared towards your safety, security and convenience? If so, you will certainly appreciate the practicality and modern design of the affordable Steel Mesh Door Cabinets provided by The Workplace Depot. 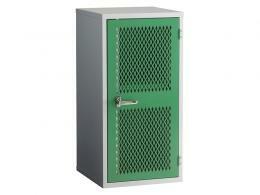 What Is the Purpose of Steel Mesh Door Cabinets? Unlike traditional cabinets that do not always manage to address your specific storage needs and fail to create a lasting impression, the steel mesh door cabinets that we sell and stock tell a different story. Their solid welded construction ensures an enclosed visibility and optimal ventilation, while maintaining security. This means that you could visualize the contents of your cabinet at any given point in time and maintain ideal storage conditions inside your unit without exposing yourself to any security risks. 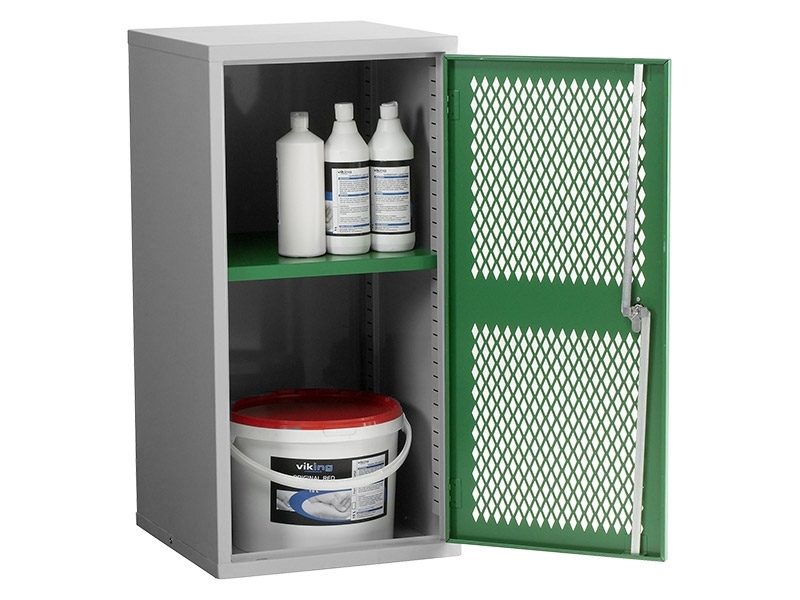 Easy to install, low-maintenance and incredibly affordable, these cabinets with steel mesh doors add character to your workspace and can help you keep your personal effects properly stored and protected 24/7. Due to its sturdy construction and versatile design, the steel mesh door cabinet model sold by The Workplace Depot is a great choice for office space, warehouses, stores, workshops and any other type of environment in need of space-saving, aesthetically pleasing organizing solutions. 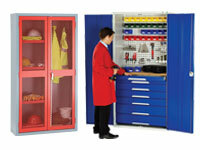 Wire mesh door cabinets are suitable candidates for various commercial and residential applications and are used by professionals operating in different sectors (automotive, construction, healthcare), who require sturdy products designed to help them visualize, store and protect their contents, such as tools, inventory and equipment, day and night. Welded steel mesh is a durable material perfect for heavy duty jobs. The wires are carefully welded together at any cross sections, to create a robust product. Heavier gauges are normally used in industrial and commercial settings to implement additional barriers, for security purposes. The mesh door panels featured by this product guarantee an optimal level of ventilation and visibility, without compromising the security of your contents. 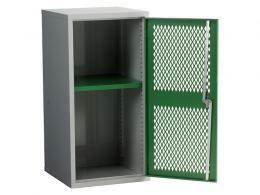 This item displays a robust 20 standard wire gauge (swg) steel construction and a powder coat finish, and comes with lever lock handles, two rods that lock the top and bottom of the unit, and two keys. This item is available in several colours (blue, green, grey, white, red, yellow) , and two standard dimensions: 457(W) x 457(D) (mm) and 915(W) x 457(D) (mm). Choose the one that is compatible with your storage requirements and add it to your shopping cart with a click.